Introduce yourself after you join, and post a picture of yourself, if you've got one. No unrelated community promotion, harassment, or racist, sexist, heterosexist, classist, etc. remarks. Discussion on these topics is welcome. Post: your art, your website link, writing, comments on zines, advertisements for stuff you make and sell or give away, trades, zine reviews, concert/shows/happenings postings (Maine only please), zine advertisements, comics, poetry, for-sale stuff, etc. Anything you post will not be considered a submission to the distro or to a zine (unless you say so) but we may contact you to ask about consignment, etc., if we really like your stuff. The mainstream media serves the interests of corporations and politicians, not the people. We need access to media and art that tells our stories. Independent media, artists, poets, musicians, and revolutionary thinkers deserve promotion and a forum in which to distribute their work. Our mission is to promote and support artists, thinkers, poets, musicians and writers through the distribution of zines, crafts, literature of all types, and art which is too brilliant and subversive for mainstream media and venues. Artwhore Distro is currently run by a handful of volunteers: Zeraph (boy-thing-in-charge, financial, website design, consignments), Zoey, (strategy, bright ideas, new zine acquisitions & reviews ), James (general helping-out, tabling), Evangeline (again with the helping). If you're an artist, musician, writer, poet, web geek, zine editor, or just want to help out in any way, WE NEED YOU. We're always looking for more zines, literature, merch, demos, and ideas. We're striving to be a collective of volunteers and encourage everyone to get involved in some way whether it is selling your stuff, tabling at shows, donating lit or free materials, or of course money (see "donate" on the main page of our website), helping out with your skills or connections, buying zines or art, joining our livejournal community, adding us on myspace or just hanging out and exchanging ideas at our tables at a fair or concert. To find out more, click here, or email us! We're based in Portland Maine but we table at shows and events all over Maine and sometimes elsewhere. You might see our tables at fairs, concerts, food not bombs, punk shows, protests, gatherings...wherever good zines are appreciated. 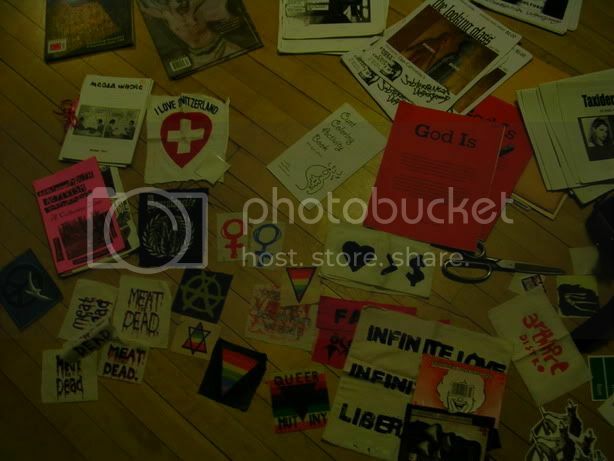 We usually come armed with a big box of free stuff, dumpstered food, and cheap patches, zines, stickers and pins. We'd love to hang out and talk to you about zines, d.i.y. projects, projects, activism, or anything else. Go to our website to find out about upcoming events. Artwhore Distro, 122 Emery St. Apt. 2F, Portland ME 04102.